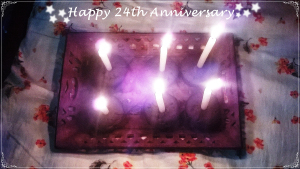 Yes it’s the 3rd of February and also the 24th Wedding Anniversary of my parents…and yes there were gifts and cakes..Choco-muffins..
And the Anniversary Feast lunch was prepared in their honour by me..
Here’s a picture of what was there in the menu.. 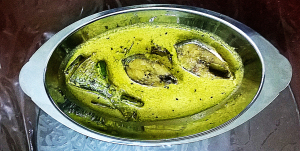 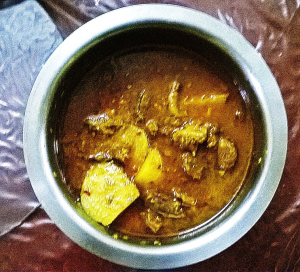 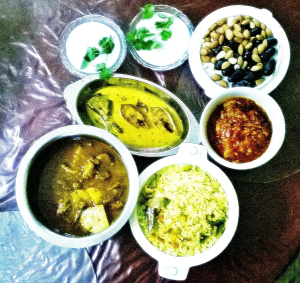 There was the traditional Bengali dish.. 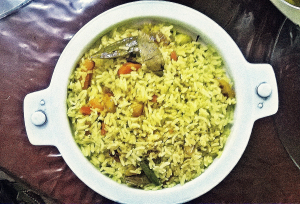 The Vegetable Pualo made with stir fried vegetables and Basmati Rice entrapping the sweet aroma of ghee and garam masala (cardamom, cinnamon and cloves)..
Then there was A Mutton Curry with Potatoes .. a spicy curry to complement the Vegetable Pulao..